It is the new “thing” for kids with Down syndrome and other special needs. Instead of having them stuck in a special education room, separate from their typical peers, as they have been since I was a child, they are included in the typical classroom. The idea is that having everyone together will promote better understanding of differences for the typical peers, while giving the kids with special needs a sense of belonging and challenging them to be the best they can be. If you have a child with special needs, and you belong to any kind of parent group (in real life or online), you know all about inclusion. It is all some groups talk about. It is the right thing to do! It is the only way! 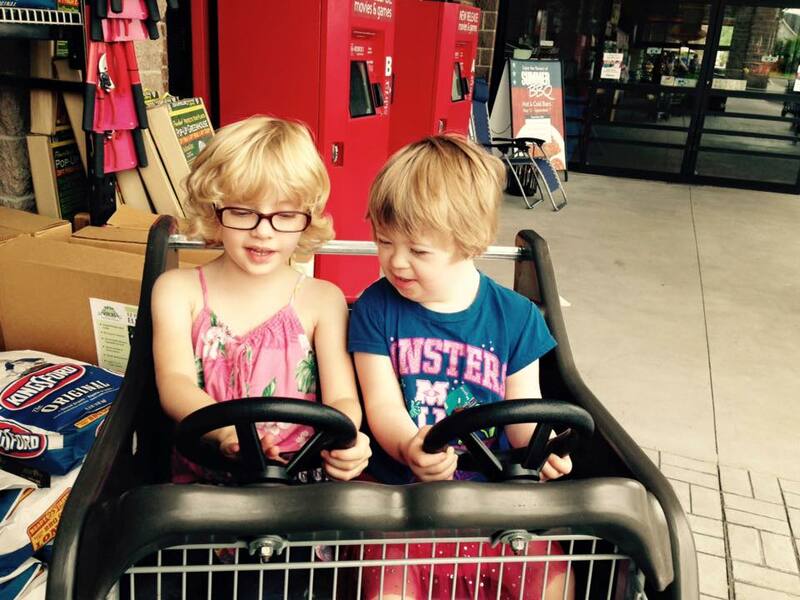 You must push for inclusion or you are doing your child a huge disservice! At least that’s how it seemed to me, when the time came to enroll Ellie in kindergarten. The thing was, I wasn’t sure about all of that. Ellie has some pretty significant delays, and I really didn’t feel that being in a typical classroom all day was right for her. So we opted to have her in the Life Skills (the new name for special ed) class for the majority of the day, with only a small fraction of her time spent in the typical class across the hall. It worked for her for the most part. With her speech delays and the fact that she couldn’t even draw a proper circle yet, it made sense for her to be in a smaller class where she could get more one on one attention. She was being taught the same things as the kids in the typical class, but on a slower schedule. The typical class spent one day on each letter. Ellie’s class spent two to three days on each letter. If Ellie got tired (as she often does) she could curl up on one of the little mats and take a short nap, then wake up ready to learn some more. The kids in her typical class loved her, and whenever she missed school would ask when she was coming in. We’ve been working on having her in the typical more and more as the school year goes along. Because inclusion is the way to go, right? The problem was that Ellie was missing more and more days of school. The plethora of germs that abound in a kindergarten classroom were doing a number on her health. While other kids (like Laurel) can get a cold and be over it in a couple days, when Ellie gets sick she stays sick for a week or more. Then, around Thanksgiving, she got really sick. And didn’t get better. After three rounds of antibiotics, several chest x-rays, nebulizer treatments, and missing a month of school we finally saw a pulmonologist who diagnosed Ellie with asthma. With the help of yet another round of antibiotics to clear up the pneumonia she had developed along with a new regime of asthma meds, she finally got healthy. Then she went to school for a week. Luckily we’ve been snowed in this entire week, because she’s sick again. At least it won’t count against her attendance, since the school has been closed. We are just hoping that she’s well enough to go to school on Monday. I haven’t looked at the numbers lately, but I’m fairly sure that she’s been out of school almost as much as she’s been in. During her two months of sickness, Ellie’s pediatrician said something to me that really stuck. I laughed it off at the time, because really, what was the alternative? But it’s been in there, in the back of my brain while we’ve worked to get Ellie better, and it’s made me really reevaluate what Ellie needs vs what the Down syndrome community as a whole has been pushing for. At what point does the push for socialization and interaction with her peers get outweighed by her need to stay healthy? How much education is she really getting, when she is missing days, weeks, even a whole month of school? What, really, are the alternatives? Luckily, we live in Pennsylvania where there are a lot of educational options, from public and private schools to charter schools, homeschooling, and cyber schools. Laurel attends a public charter school for the arts, but a brick and mortar school of any kind would cause Ellie the same problems as her current situation. That leaves home and cyber school. I know myself too well to pretend that I have the discipline to homeschool my child. I need to be accountable to someone or I will let her slack off. That leaves cyber school, which will give us the flexibility we need (we’ll actually be able to get Ellie all of the therapy she’s suppose to have, since we’ll be able to do it during the day), the ability for her to learn even when she’s home sick, and keeps me accountable because we have to login every day. I am meeting with PA Cyber’s IEP team in a couple weeks to talk about pulling Ellie from her current school and enrolling her in cyber school. I am doing the least inclusive thing I possibly could. And you know what? That’s ok. Because sometimes inclusion isn’t the right answer. Sometimes your child’s immune system can’t handle being in a class of 20 other germ infested five year olds. Sometimes interaction with that many kids is too overwhelming for all of their senses. Sometimes school is just too much for your child’s body, mind, and spirit. Sometimes you have to listen to your gut, not the mommy group. I think that inclusion is a great thing, and that it does a lot of kids a world of good. But it just isn’t right for us right now. Maybe when she’s older and stronger she’ll be able to handle being in a brick and mortar school. For now, we’ll keep her home and let her immune system have a break from the constant onslaught of germs and stress that she’s been dealing with since September. We’ll have more control over her schedule and her education, and that is what’s best for Ellie. should be in a regular kindergarten class. understands the world around her. And it turned my world upside down. I never thought she would be able to do that. that they knew what they were talking about. After all, they are the experts. if that isn’t what she needed? Is it because it is easier? Didn’t they want to help kids? an aide in the room cost? casting light into the darkest hearts. March 21st is World Down Syndrome Day, and I it occurred to me today that that means that it has been five years since I found out that our little Ellie Bean had Ds. I was 18 weeks pregnant when we had the amnio done, and it was about a week until we had the results back, making March 21st pretty darn close to the day we found out that she had an extra chromosome. We had our suspicions before-hand. The extra fluid on the back of her neck at the 12 week nuchal translucency test (when we also found out that we were having twins), combined with the particular heart defect that she had pointed at Down syndrome. But it was still a shock to the system, holding the print outs of our (now confirmed) girls’ chromosomes in our hands and seeing the third copy of number 21 sitting there. I remember calmly talking about what this all meant with a very nice genetic counselor, who tried really hard not to cringe when she told us that we still had the option of trying to selectively abort one baby, but that at this stage it was very possible that I would lose both in the process. She was visibly relieved when we told her that abortion was out of the question. We loved our girls, no matter how many chromosomes they each had. Then I went home and cried. A lot. I’m not going to lie about it. I was heartbroken. Not at the thought of having a child with Down syndrome, per say. I didn’t have much experience with people with Ds, but from what I had seen, they seemed like pretty happy, healthy folks. I was the loss of all the things I had envisioned for my child that hurt so much. She would never drive a car. She would never go to college. She would never get married and have babies of her own. She would never be a famous writer or artist or doctor or dancer. Would people make fun of her? Would she sit in her room, crying, because her sister had a date to the prom, but no one had asked her? Would she watch Laurel drive off to college and wisht that she could go, too? After a couple of pregnancy-hormone fueled days of this, I hopped online and started doing some research, where I found that most of my fears were completely unfounded. 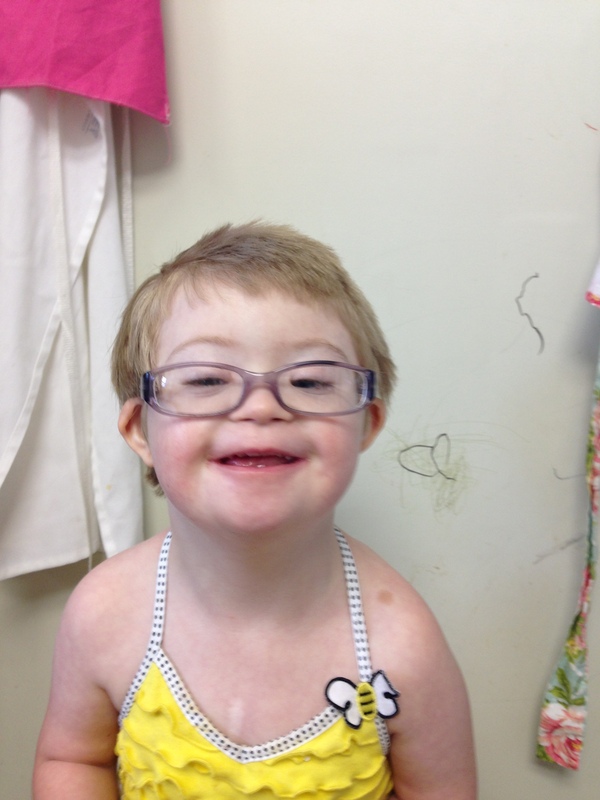 People with Down syndrome do all of the things I thought she wouldn’t. I had an image of Ellie being shunted off to a dreary special ed room with the other “disabled” kids, like when I was young, but that isn’t how things are done any more. Next year, when she starts kindergarten, Ellie will spend a decent part of the day in a regular classroom with the “typical” kids. She’ll have extra help, of course, but it really isn’t like it use to be. One day Ellie will go to the prom, and there are more and more colleges that are opening their doors to kids with special needs every year! Our little Bunny’s future is pretty darn bright, and you had better believe that she isn’t one to feel sorry for herself. A lot has changed in the past five years, but some of the biggest changes are happening right now. For the first four years of Ellie’s life, she was, quite frankly, coddled by Chev and me. She was our baby long after Laurel started to become her own little person. The combination of Ellie’s developmental and speech delays made her more apt to sit in my lap and snuggle than to explore the world. But something has changed. Ellie is starting to talk, and that has made her bolder, more confident. She has found her voice and at the same time she seems to be finding herself. It is a fascinating thing to watch. Just in the past few weeks, she has started to string words together into short sentences, and she can now hold a conversation with us about simple things. She has NO problem giving her opinion, either, and woe betide the person who tries to ignore her when she wants their attention. She is growing into her own person, and that person is pretty fantastic. I can’t wait to see what she’ll be like in five more years. Also, if you are interested in learning more about the college opportunities for people with Down syndrome, or are feeling generous, check out Ruby’s Rainbow and take their 3/21 pledge. The Ellies of the world thank you.